The photo above has some crazy light...but I kind of like it. 1. First Colette Pattern ever purchased... now almost two years ago. My first attempt at the Sencha blouse was an awful failure - between my inability to deal with the silky polyester and making a size way too small because I was used to crazy design ease. I have finally made a fitting version of this top! 2. First time using silk. 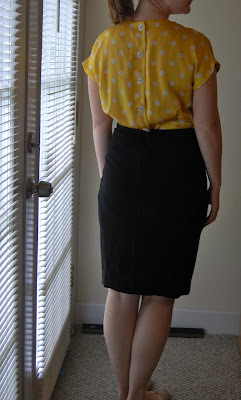 Yellow Polka Dot Silk - my favorite purchase from shopping in NYC. Though tricky at times, completely worth it. Silk feels so much nicer than synthetics! Almost burned it a couple times with the iron as well... but crisis averted. I love this! It looks so cute on you! This was one of the first patterns that I bought, but I've had serious fear of making it since then (I'm just not sure it will be flattering on me, and I don't know that I have any skirts to wear it with! ), but your bright and sunny version is making me reconsider! You look so lovely in this color! Wow! thats so cute in yellow!